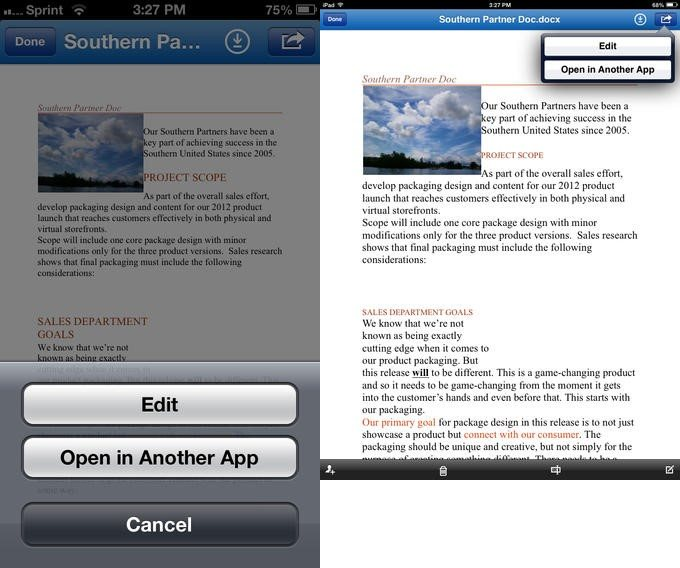 Microsoft today released SkyDrive Pro version 1.1 for iOS, adding mobile editing support. You can download the new version now directly from Apple’s App Store. The documents you edit remain in their original source location on SharePoint Online in Office 365. This means you can modify Word, Excel, PowerPoint, and OneNote documents without having to manually download and reupload them when you’re done. Integration with the Office Mobile app and Office Web Apps for editing Word, Excel, and PowerPoint documents. Integration with the OneNote app for viewing and editing notebooks. This is certainly a key update for users of various Microsoft products. Unfortunately, it’s difficult to see how businesses who aren’t already heavily entrenched in the Microsoft Office world will choose this option over the competition. Most notably, Google in April began offering Quickoffice for Android and iOS for free. Last month, the company launched both apps for free for everyone. Meanwhile, Microsoft is still sticking to its Office 365 strategy.